The film won a Gold Standard award and a sponsor's prize from Focus Music. 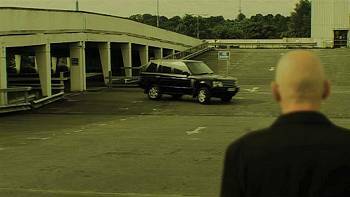 The inspiration behind Car Park was in fact, the location funnily enough. The location came first, the story came second - not strictly the right way to approach a film but then we are not the type of filmmakers to be too concerned about that ! Preparation was the key to the success of the film. Much time was spent taking photographs of the location to help work out shots for the storyboard, practising the shots with our video cameras and of course, making sure the remote controlled cars did what they were supposed to do! Our storyboard was created using Keynote (a Mac based programme which is very similar to PowerPoint). 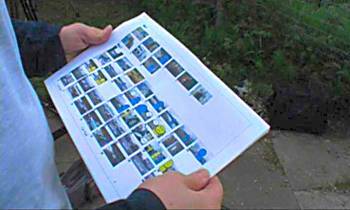 The photographs of the location were inserted along with a picture from the internet of the vehicle one of the characters was going to drive. The characters were created from basic shapes. Camera moves and dialogue (where it was required) were all annotated on the storyboard and then eventually a shooting schedule was drawn up from that. going into entrance and up first ramp. The main shoot lasted a day with a further morning to capture one character's journey to the car park. All shots were filmed using a Sony PD170 and Canon XM1 camera, either hand held or using various stabilising equipment such as tripods, dolly and track, steadycam and a monopod turned upside down to capture the feet of the characters and the remote controlled cars. Interestingly, the more complicated shots went okay but the relatively easier shots took longer. The scene where you see a close up of the bags being put down and the cars being taken out, proved more difficult than you can imagine. Two people trying to prise out a car from a bag and placing them down at the same time had us crying with laughter after the tenth take ! We wanted to apply a certain style to the film, rather like the film Lock Stock and Two Smoking Barrels. Colour was desaturated slightly to remove that 'video look', a filter applied to get the overall style and then checked against television specs to ensure the colours did not exceed them. A first draft edit was created and then a soundtrack built up around it including sound effects of police sirens etc. A final soundtrack was produced and then a final edit produced to match it.